Why Don’t We Teach Students to Think Sociologically? Textbooks often promise to teach your students how to “think like a sociologist,” but what do they actually do? Most simply relay sociological theories and research findings to your students. That is, they tell your students what sociologists think, but not how sociologists think. But come to think of it, the very same thing could be said for how I often teach sociology and how it was taught to me. Most of my undergraduate sociology education could be roughly described as my teacher saying to the class, “watch me as I sociologically analyze this aspect of society.” Then once the teacher reached their conclusion they would step back and say, “See? Did you see how I came to that conclusion?” If the whole class was still lost the professor would pick another similar topic and sociologically analyze it. And again s/he would ask, “do you get it now?” In the absence of direct instruction, sociological thinking is taught through repetition, trial and error, and inferred meaning. “But there is no one way to think sociologically!” I imagine many of you are shouting in your mind. When discussing thinking like a sociologist with colleagues I am often told that there really isn’t a sociology to speak of, but rather many different sociologies tenuously connected under an umbrella term. This is a cop out. Especially for a discipline that prides itself in seeing commonalities within absurdly complex systems. I think we need to teach sociology differently, especially intro courses and especially large sections of intro. My plan is to spend 2015 identifying the areas for improvement and then using empirical research to inform the creation of solutions. This is the first of what will be a year long series documenting my attempt to reimagine intro to sociology and remake myself as a teacher. I said I think we need to teach sociology differently above, but I know for certain that I need to teach it differently. My Soc 101 class will be my laboratory for this project because I know that my class and the way I teach it are perfect examples of what’s wrong with the large format intro to sociology class. I’m not trying to be self-effacing or modest, but honest. I’m also not trying to make anyone else feel bad for how they teach their classes. I teach between 200–400 students in a single intro class which limits what I can do, but I think many of us (first and foremost myself) over estimate what’s not possible in a large class. For instance, I fundamentally reject the idea that having a large section automatically requires the class to be lecture based and void of any written assignments. And I am not going to be a martyr for sociology. I’m not going to spend every hour of the day grading or tending to my classes. The idea that you either forego written assignments in large sections or sacrifice all your free time grading is a false dichotomy. What I’m suggesting is, we should accept the very real constraints on ourselves and our classes and then innovate within them. Sociology exams have a way of blindsiding students. “I was just certain I had aced the test until I saw online that I failed it.” I have heard statements like this after every exam that I have ever given. Maybe my approach to teaching and assessing student learning is to blame, but I’m guessing that many of you reading this have experienced the same thing. So what gives? The problem seems to lie in our student’s ability to assess their knowledge. Students’ have unwarranted confidence in their mastery of course content. They feel they know things that they in fact don’t. Research out of the UCLA Learning and Forgetting Lab suggest the problem may lie in how our students are studying. I’ll let Robert Bjork explain. I hear Bjork saying, that when students try to judge their understanding of course material by looking at their notes and course texts, those judgments “will be very flawed.” This works in a way similar to the hindsight bias, once you know the answer it’s easy to presume you would have been able to do so without the help of your notes. So the best thing for students to do is to try and externalize their ideas so that they can assess them. Students who study with their peers, quizzing one another, will have a better understanding of what they know and what they don’t. The first question we should ask a struggling student is, “If I had watched you while you were studying for the test, what would I have seen you doing?” When students say that they, “reviewed their notes, reread chapters, etc.,” we have to encourage them to externalize their studying process. When a student is angry pull them closer to you. Embrace their critique and thank them for it. Show them that you really hear what they are saying and ask them to keep talking. If right now you think I’m crazy, that’s okay. This is a counterintuitive approach and that’s what makes it both disarming and pedagogically rich. To understand why this approach works, first we have to examine how teachers commonly frame a student’s vehement challenge. When a student challenges you, how do you respond? Or let’s take a step back, what are the adjectives you use inside your head when thinking about a student assertively challenging you or the ideas and research you are presenting them? It’s not uncommon for teachers (myself included) to frame a student’s challenge as “an attack” or frame their posture as “willful ignorance.” We might tell our colleagues afterwards that we had to “defend ourselves” from students who were “not willing to learn” or “blinded by their [insert perceived culprit].” The crucial self-reflexive question that we should ask ourselves is, what are we defending and how does that affect our teaching? Most of the time we are protecting our identities as teachers. We have spent years in graduate school and in our careers developing our identity as a competent teacher and content expert. But every teacher, no matter how developed their teacher identity, has a voice in their head that questions their competency and wonders if their identity is built upon a foundation of self-deception. The point I’m making here is that it is perilous to conceptualize a student as your adversary. But if this conceptualization still rings true for you, then my suggestion is you employ an Aikido like approach to your students. In Aikido, you are trained to redirect the energy of your attacker. In this case, you take a student’s powerful energy and redirect it toward your learning goals. This is a classic deescalation technique. You are showing the student that you are hearing them, you are affirming their point of view, and most importantly you are role modeling civility and inviting them to join you. This is a powerful, mature, and authoritative response that projects confidence and compassion. From here, encourage your students to continue talking. Often their outrage is based upon a misunderstanding of the course material, an error in logic, or the fact that they have privileged their anecdotal experiences above the empirical evidence you showed them. Ask questions that will direct the conversation to these mistakes. You will often find that the student’s own inner teacher will emerge and teach the students to better understand the material, acknowledge their logic errors, and accept that their anecdotal evidence and the empirical evidence can both be accurate. There are numerous examples in society of how we adjust our expectations and tact when working with novices. For instance, when we deal with children, or a “new hire” at work, or the server at the restaurant who is “in training” (Goffman 1961/2013). I’m not suggesting that we “coddle entitled students”, rather I’m suggesting that we reframe student challenges as a passionate request for help. The office drive by is the worst. A student walks by my office door, sees me inside and says, “Hi, Prof. Palmer are you busy?” Then there eyes fill with this look of vulnerability. In the past I used to just say, “Yes I am. Could you send me an email or come back during office hours?” This was always followed by an awkward moment. Students either were angry that I was being so selfish with my time or they just looked sorta heartbroken. But now I know the secret to deflecting the office drive by. “I am, but I always have a moment for a student like you.” I say with a smile. This approach works because it 1. allows a student to feel heard and 2. it screens out questions that can be answered instantaneously. I’ve often thought how funny it would be to go over unannounced to one of my student’s dorm rooms and just knock. “Hi, are you busy? I wanted to talk about our class for a minute.” The look on the student’s face would be priceless. What do we call sociological research done by untrained sociologists? In it’s simplest form sociological research is nothing more than the making and testing of hypotheses about the social world (i.e. groups of people, institutions, culture, etc.). We all do that every day. You can’t make sense of the world without doing informal sociological research. So what do we call this untrained sociological research? 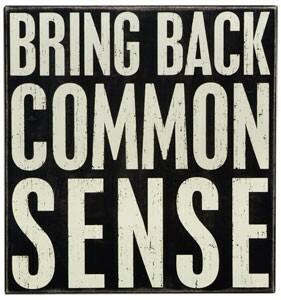 What I’m talking about is not common sense. As Mathesin (1989) points out, common sense is a body of knowledge, not a methodology. What I want to talk about is the methodology people use everyday to explore the social world. To be clear, I’m talking about the non-systematic observations of anecdotal evidence, hearsay, and media reports used to draw conclusions about the social world. What should we call that? We should call it intuitive sociology. “without the use of rational processes”. Intuition is also BFF with the confirmation bias, as it’s conclusions are often drawn “based on or agreeing with what is known or understood without any proof or evidence”. Therefore I define Intuitive Sociology as the non-systematic, non-empirical process of making and testing hypotheses about the social world that is carried out without conscious reasoning. The findings from this methodology are often selected based on the prior beliefs and/or needs of the individual using the approach. Intuitive sociology matters because it is what our students bring with them into our class room. The first challenge any sociology teacher faces is convincing students that a rigorous, conscious, rational, empirical methodology offers them something that their intuitive sociology methods cannot. You have to show them that intuitive sociology is flawed and produces a vision of the world that is often inaccurate. You have to give them “new eyes” to see the world around them again for the first time. Our students will spend the entire semester going back and forth between their intuitive and scientific sociological methodologies. They will waffle between anecdotal and empirical evidence. Keeping this in mind can help us be more empathetic and patient teachers. Sociology is not a religion (to Comte’s chagrin). Obviously, sociology like all scientific endeavors is also flawed. Any first semester grad student can rail on the subjectivity of science, but I’ll spare you as I’m guessing you already know the deal. Empirical methods cannot give us the “Truth”, but they can provide us with a perspective that intuitive methods cannot. We also need to honor the experiences of our students. Shaming their use of intuition or ridiculing their common sense is a counterproductive approach to teaching. We should not present sociology as diametrically opposed to intuition and common sense because in reality they are interconnected, but that’s a topic for another day. I think the best we can hope for our students is that when they leave our classes they will find ways to use their sociological imaginations in conjunction with their intuition and common sense. The Next America by Paul Taylor is an outstanding and approachable book that I plan on using in my sociology classes this fall. The book is a tour de force of social statistics. This is no surprise given that it was written by the Executive Vice President of the Pew Research Center Paul Taylor. What makes this book so outstanding is how it manages to integrate sociological research with Pew studies, while at the same time never overwhelming the reader with a stats attack. If you want to show your students how to write and explain data, this is the book for you. Taylor lowers the on ramp to social statistic and demography and presents a picture of the United States as an ever changing social system full of surprises. Statistics are used to dispel a myth of common sense, to highlight a piece of the American mosaic, or to help the reader make sense of a seemingly chaotic social world. As the book’s title alludes to, Taylor is primarily interested with how birth cohort affects perceptions, attitudes, and behaviors. In each chapter the data is segmented by each of the living generations (Greatest Generation -> Silents -> Boomers -> Xers -> Millennials). After reading a few pages, the reader can’t help but see that our perceptions of the world are guided by the historical moment we live in and have lived through. In other words, this book is amazing at showing how historical context affects an individual’s perception of the world around them. As I’ve recently lamented many of our students intuitive understanding of the social world is built upon an ahistorical framework. I am hoping that a text like Next America will pry open my students’ minds to the role historical timing plays in their lives. While the dramatic title would have you believe this book is all about the “looming generational showdown”, that was really only the focus of 3 chapters. The rest of the book looked at how the different generations felt and behaved on issues like marriage, religion, immigration, racial inequality, and use of digital technology. If you are looking for a quick introduction to the sociological research on any of these issues, this book is hard to beat. In this way the book serves as a public facing edition of the Annual Review of Sociology. As a bonus, Taylor was interviewed by Jon Stewart about Next America. This short (6 min) clip will be a great way to introduce the book and the author to my students this fall. Taylor’s work is strongest when it focuses on sharing the wealth of demographics and social data points. When Taylor strays into drawing conclusions and predicating the future the results are a mixed bag. While this book uses a lot of sociological data it is not a sociological book. At times I winced as Taylor espoused the dominant ideology (e.g. racism for the most part is a thing of the past). To his credit, Taylor often presented data that challenged these dominant ideologies. To his discredit, these contradictions were rarely acknowledged and I anticipate having a few confused students. All that said, science is often a contradictory process, so dealing with conflicting arguments is a skill that I hope to develop in my students. This book is a winner and I plan on using it for at least the next few years. The curated presentation of real time social data that this book offers alone warrants your consideration. I could give the same reasons for why I lecture as much as I do. Standing in front of a room full of people ready to hear what you have to say is exhilarating. There aren’t too many places left where a person can get a group’s relatively undivided attention. It’s nice to feel heard. It’s fun to tell jokes to a room desperate for a laugh. It’s easy to feel really smart and competent explaining entry level concepts to beginning learners. We all have egos and for some of us, myself included, the classroom is a space to “fill our buckets” as my 6 year old would say. Despite pulling Walter White into this conversation, I don’t think there is anything wrong with enjoying teaching. And I don’t think there is anything shameful about enjoying feeling competent and proud of the work you are doing, especially if you feel the work you are doing is an important social good. Many teachers struggle to develop alternatives to lecturing. But this can easily be overcome by reading books like Classroom Assessment Techniques, Student Engagement Techniques, Active Learning, and Collaborative Learning Techniques that are full of ready-made student driven learning activities. Even if you removed every barrier and made switching to a student-centered teaching style as easy as possible, many of us still wouldn’t do it. Because we like lecturing. We are good at it. It makes us feel alive. I once heard Annie Lamott, a successful author, say that reading the positive reviews of her books was like “a giant mound of cocaine for the ego”. She went on to say that to become a good writer you have to deny yourself these mounds of cocaine and simply focus on the work of writing. Maybe the exact same thing could be said about forgoing the “giant mound of cocaine for the ego” that is lecturing and being the “sage on the stage”.